I mentioned on the last post that I was going to baste together the lace and the lining to create one piece to work with, but I didn't enjoy the way it was turning out. Basting is simple. 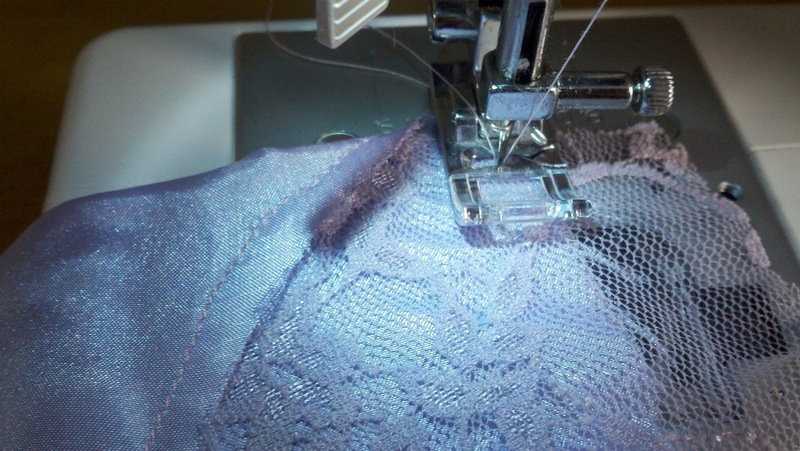 You turn your stitch length up high to create longer stitches. Usually on machines it's a 4, though mine goes higher. I started basting together the bodice, but I decided that I wanted it to be more secure so I went back and stitched the bodice pieces together normally. 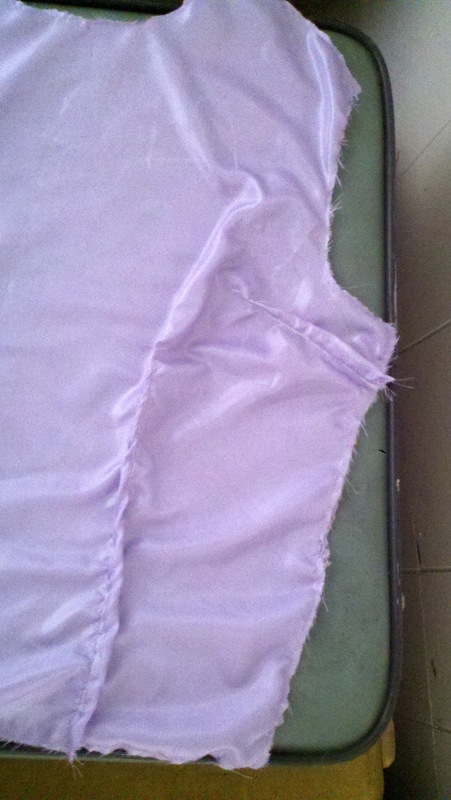 So after that, I just stitched up all the sides to make sure everything was right. After sewing around all the edges, I went ahead and sewed my darts. 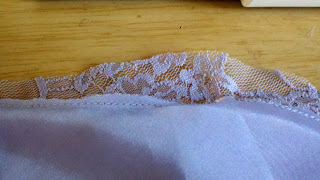 Because I marked them on the lining and because my two pieces of fabric were one, it was now incredibly easy to stitch the darts up. 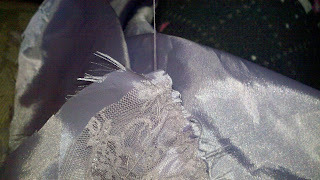 Then I turned my attention to the skirt. 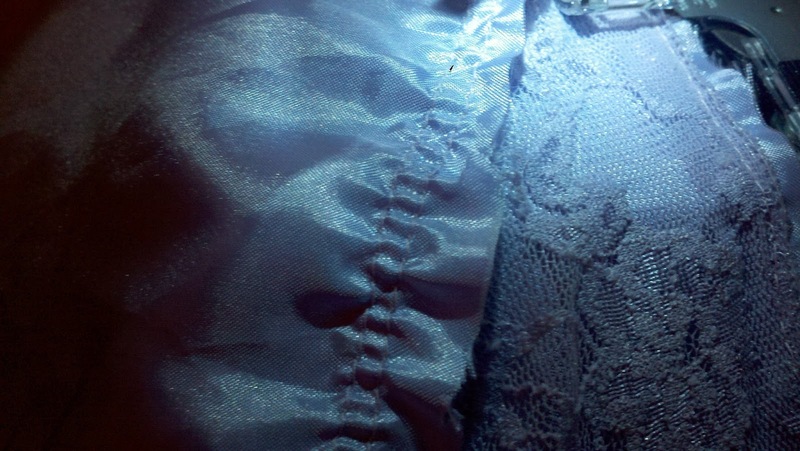 I did not trace around the entirety of the skirt as I did the bodice. 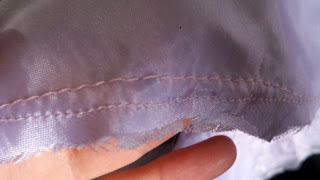 Because I am working with such large chunks of fabric, it didn't seem as important to me that they be perfectly connected. 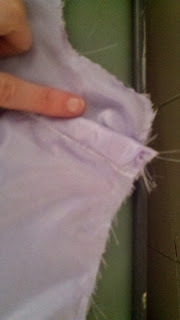 Because the skirt is a bit full, I started to gather the top seam. I turned up my stitch length to 3.5 and then I sewed 2 lines, one right after the other.Leave plenty of thread tail at the beginning and end of your stitching. You can see it below, and you can see how it's already starting to pucker because of the longer stitch length. Finally, after sewing the two lines, I took the back two threads and held them while I began to pull the fabric. It creates a ruffle and you can make it as big or as small of a ruffle as you'd like. Whew! Took me long enough to get to this point! How is everyone else faring? Also apologies for the awful pictures. My regular camera died, my replacement camera is awful (and I lost the battery charger), and my phone, despite its boasting of HD 10MP, etc, etc, takes terrible pictures as you can see. I should have another, better one coming in a few days! So sorry about the camera. :( I TOTALLY sympathize with the technology fails lately. 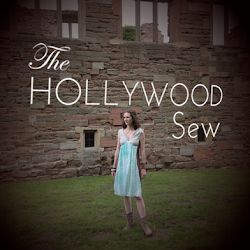 Nice work on the dress! This is going to be beautiful, Kristin! Sorry about your camera woes. 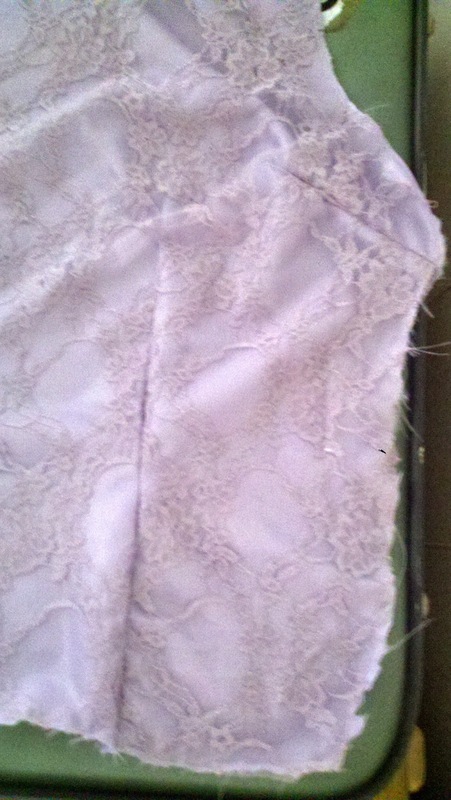 I worked on my daisies tonight, and will hopefully finish soon. Had to make a few fitting adjustments, but it should all work out. I'd love to finish tomorrow in honor of the first day of spring, although it doesn't feel the slightest bit springlike out there. I'll wear my Ode To Chuck Cambie, a huge warm scarf, and a winter coat! Good luck finishing yours up. It really does look gorgeous so far.